Last year, Coach introduced a new bag – the Borough Bag – as part of their line up and that was quite a success, it seems. 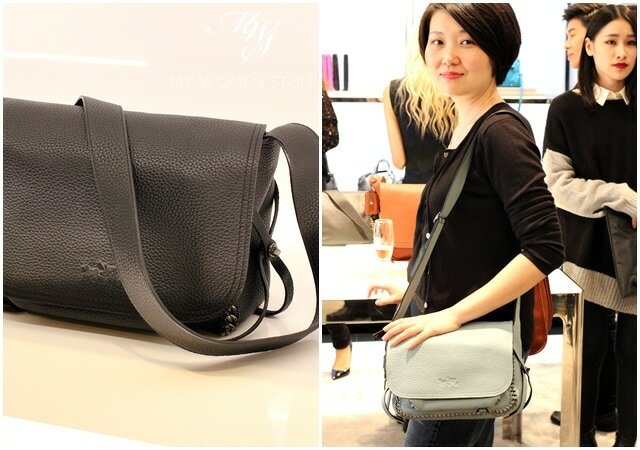 The sleek clean lines of the bag was reflective of Coach’s heritage and it was well received. This year, Coach welcomes a new designer, Stuart Vevers, who has taken a bold, and some might say, refreshing step away from the clean lines Coach is known for, and giving it an edge. A new star bag is also introduced, the Rhyder bag, which is edgy, young and yet, will appeal to those who want a fairly affordable, embellished satchel type bag. While the Rhyder bag does get my attention somewhat, I can’t honestly say that the rest of the Fall/Winter 2014 collection was my style. Here’s the Rhyder 32 in Fuchsia. They come in 2 sizes, Rhyder 32 and Rhyder 24 and a variety of colours including, yes you guessed it, black. I personally would do one of the fun colours like Fuchsia (pink) or Coral (orange) or better still, Turquoise because I think it adds to the fun factor of the bag. Black is a nice, serviceable colour, but it makes the bag look a bit heavy and dull. Let me show you how the Rhyder 24 and 32 differ in terms of size when I carry them. The difference is quite significant. The Rhyder 24 is adorable if you like small bags but yet want to carry a few things around, because it’s fairly roomy despite the diminutive size. The leather is soft and smooth and quite typical of Coach leather and I must say this, feels nicer and of better quality than previous bags. The lining inside, although cloth, doesn’t feel as cheap as what I’d been used to from Coach before this. Definitely a step up in terms of quality here which is good to know! The Rhyder 32 is a work-horse. It will fit a ton of stuff but be warned that it does feel a little heavy without anything in there, so if you fill it up, it will weigh you down. Both have a top handle but come with a detachable strap and I love that. I’ve come to appreciate bags that come with a detachable strap because there are times when you want to leave your hands free and they come in handy. My personal thought is that if you like the Balenciaga Motorcycle bag style then you may like the Rhyder, as a more affordable (and lighter) alternative. I’ve always lusted after a Balenciaga so don’t mind me LOL 😛 But if you’re a Coach traditionalist, and more in favour if its simple, sleek lines and style then you may wrinkle your nose at this one. 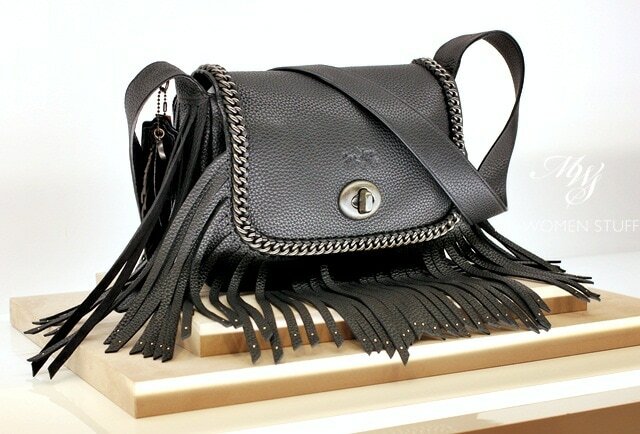 And speaking of wrinkling noses, well, suffice to say that this Dakotah Fringe Flap Crossbody (RM3,400) doesn’t get my stamp of approval. Happily, Coach also did a Dakotah Crossbody without the fringe. The Dakotah Crossbody (RM3,150) is much more restrained but the leather strip embellishments are still there along the side and there is a weave around the edge, but less obvious. The logo is embossed which I like. I like it when logos are unobtrusive. I was rather taken by the light blue version as you can tell. When you lift the flap, there is another strip of leather that holds everything in because there’s no zip but I found the whole thing quite fiddly. I like the shape as a whole, but it’s not a bag I’d use. 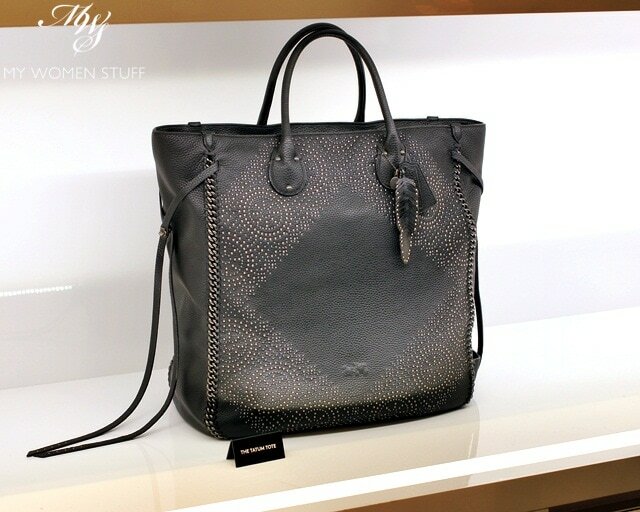 If you’re into huge bags however, then the Studded Tall Tatum Tote (RM4,700) might be what you’re looking for. This one is HUGE so it’s strictly for taller women who like big bags, or men. I could probably fit my nephew in this one LOL! Again, the laser cut leather and the feather charm brings to mind Native American designs which either appeal to you, or won’t. 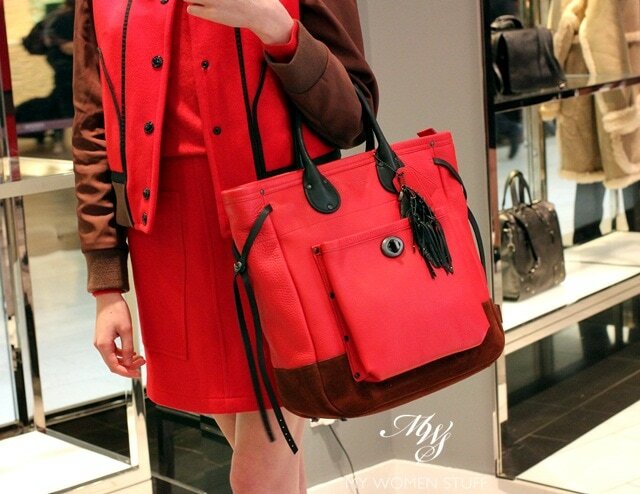 A more simple design of the Tall Tatum (RM3,700) is seen here in a lovely red with the classic Coach turnlock on front. The model makes it look almost wearable doesn’t it? But bear in mind that the model is tall so it looks more proportionate on her than it will on 5′ 3″ me. 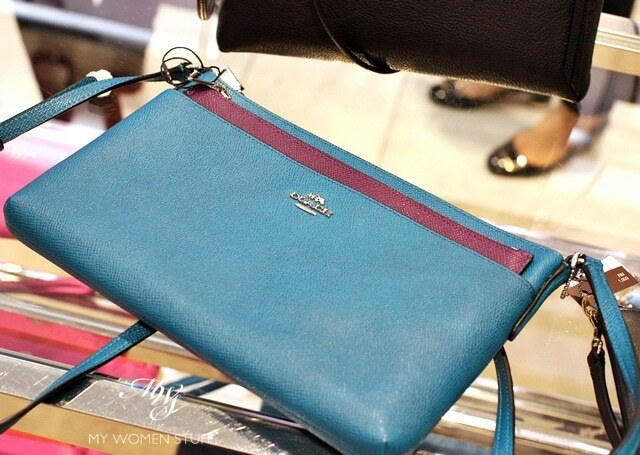 I did however find myself hovering over one sling bag that I loved for the colour and design. Coach calls this simply the Swingpack with Pop up pouch (RM1000) and what it is, is a small sling pouch that you can wear cross body and fits just the essentials, but comes with a contrast colour, detachable pouch! You can see it here in teal and purple and there’s another pink-orange colour combination. I thought it was very cute and very practical and fun. One of those things I’d tote about on weekends when I have nothing in there except a wallet or change, my phone and keys. It also comes in smaller wristlets if that’s your thing and of course, prices go down proportionately. No I don’t do this often, hence the awkward pose & the super boring outfit – no fashion blogger that’s for sure! 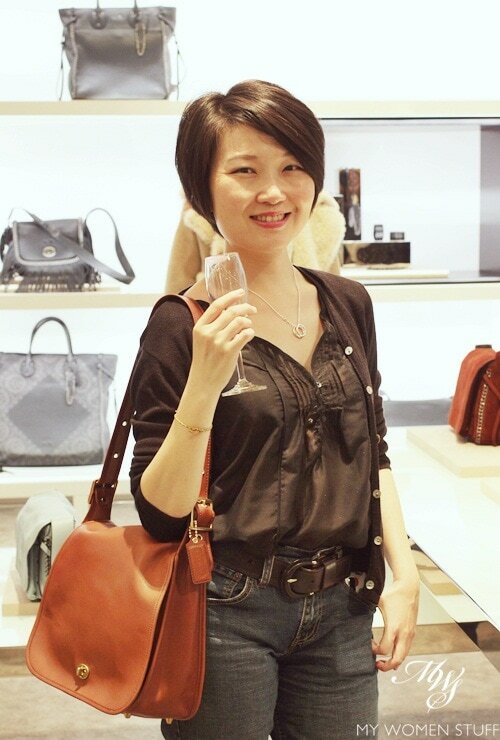 I’m a fan of Coach’s Legacy collection and this is the Coach Classic Stewardess Bag which was gifted to me by a dear dear friend. It fits a lot, the leather is beautifully soft and it’s actually very well made. I enjoy my high end bags, but at the end of the day, what I really enjoy is a well made bag and Coach was my very first higher end leather bag (I had the Legacy bucket) so I have a soft spot for the brand. I think they lost their direction for a bit during the Age of the Monogram bags when they were churning out collection after collection like MAC, but I’m glad to see them returning to leather. So, that’s just a little glimpse into what Coach has to offer. I’m curious to know what you think. 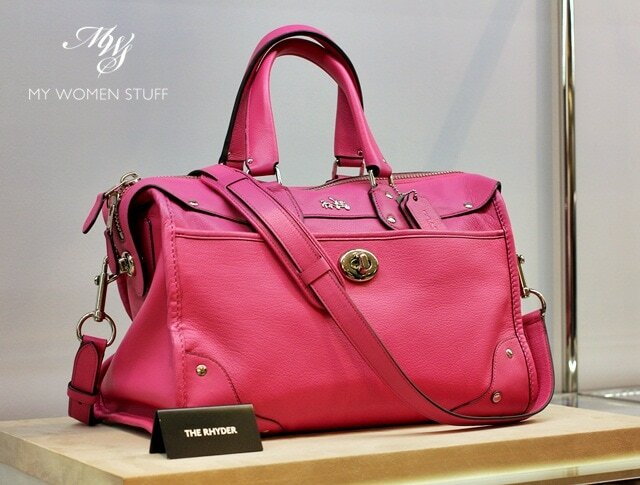 Is the Rhyder bag something that catches your eye? Do you own anything from Coach? You could get a vintage one from ebay for quite cheap. And the vintage ones are made in the usa and vintage leather is of course of better quality. Like here is a few I just found. I’m a vintage coach collector and have a few. The leather on these are truly amazing. I love your bag reviews!! A few days ago I was just thinking that it has been some time since you did bag reviews and I was reading your previous ones since I missed them so much. The Swingpack reminds me of the Celine trio which I did think of getting but since I have quite a number of crossbody bags, I gave it a miss. Coincidentally, as I am in the market looking for a handbag, I was in Loewe and found out that Stuart Vevers left Loewe to join Coach. Would you consider to do a review of high end bags which you would buy based on the popularity of the brands or a bag which you love but it is not so well known. my goodness, i was so horrified every time i walked passed a coach store during the age of monograms! it seemed each year, they came out with more garish colors and more sequins! i totally agree that the rhyder bears a remarkable resemblance to balenciaga. there’s really no such thing as a light leather bag; just heavy and heavier. since that’s the case, i prefer to have the satisfying hardware to look at. i’ve been lusting after a pastel pink or mint balenciaga myself but so far have managed to talk myself out of it. Heh so did I actually, and I don’t usually carry small bags! 😀 It’s so cute. For Balenciaga inspired bags, my choice will not be the Coach Rhyder. The only coach bags i think that are done well are the ones from the Legacy collection. Their Legacy collection is definitely their classic range and quite quintessentially Coach 🙂 That said, the new styles, while not for everyone (Americana can get quite dated quite quickly) does seem to boast better leather and better workmanship. I think that’s a move in the right direction for Coach. It’d be more interesting to see how future collections pan out. Oh cute!! The white Dakota crossbody looks really good on you! That being said, I have a wristlet of theirs, along with a shoulder bag. I really like the quality of their products. Thanks Joann, it’s actually a very pale blue but still very cute 😀 Interesting that you should point out that they’re looking more mature. It was this maturity that had me looking at the brand again but then I realised that it’s because of my age group LOL! I remember back in the 90’s when everyone seemed to have their monogram canvas items because they were more affordable and it’s also interesting to note that I don’t seem to see them a lot in store anymore. So while this move to a more mature crowd seems to be in line with their increase in prices, it’s a pity that they’re also alienating the younger crowd for whom, Coach was an affordable entry into a nice quality designer brand. Been eyeing the Dakotah Crossbody in Leather since this post came out! 🙂 Oh gosh the temptation to purchase it is just way too high! It’s so cute, I promise although you do have to look on the inside and see if you like how it closes shut and there’s lots of compartments in there too! How is it that I didn’t see you there? Oh, and the bag I was most drawn to is the swingpack as well, in the exact same colour. The others were a hit or miss for me. I think we just missed each other! I left quite early after checking out the collections and browsing for a bit. Didn’t pick anything up – did you?